Sheffield Eagles are preaching for a return of the discipline and harmony of the opening four rounds of the season, as coach Mark Aston dismisses any notion that his team are a 'dirty' side. The Eagles have received a red card in each of their last two outings, with youngster Blake Broadbent missing Sunday’s trip to York as he begins a two-match ban. 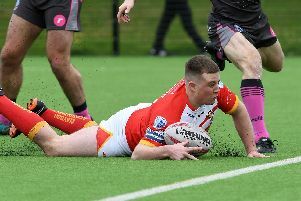 Brad Knowles also has a suspension looming following last weekend’s dismissal in victory over Dewsbury, where Aston highlighted several areas for improvement ahead of a clash against a York side who are level on points with his side. Aston has defended his troops stating they aren’t a dirty side, but expressed a deep desire to return to the standards of discipline they showed in the opening four rounds. He told The Star: “We're not a dirty side, I don't coach that, and I don't want that. “Last weekend I was disappointed when Faz (Joel Farrell) got sin-binned, and then Brad Knowles gets himself sent off and again we are down to 11 or 12 men. “It's not what we want, it is not what we are about. “It is the indiscipline that is letting us down, we’re working hard on tightening up on that." Following the exceptionally high standards of the opening four games, Aston says his side at times showed a frustration with each other at Dewsbury, in a game that was often fractious in testing playing conditions. This week, the experienced coach has worked hard on reinstating the values which have brought about their early success. “You start firing in at each other, that is the time that you have to take a step back, be controlled, and listen to the leaders who need to guide them. Aston will have to make changes to his side for the game at Bootham Crescent, with Broadbent suspended and Jason Crookes injured. The Eagles chief hinted he could still fall back on the potential of a dual-registration with a Super League side, something that has been on ice after being agreed before the season.